Hands up if you have ever been stuck somewhere without power to charge your phone? If you’ve been in that situation one-too-many times then it’s time to invest in a power bank – a compact and portable battery charger that you can carry with you to power phones, tablets, and more. Aside from being able to charge when you are out-and-about, here are our 5 most popular reasons to buy a power bank. Where phone cases were originally envisioned as providing protection, they have now morphed into a fashion accessory. There are hundreds of thousands of designs available with professional artists also embracing the medium to ink their own ones. While power banks serve a different function to phone cases, there is a growing scene as they become a fashion accessory in their own right. Typically found in the standard black casing, there are numerous color alternatives to choose from that can match with your phone and case. And just like how artists and designers have their own line of phone cases, companies and design firms are teaming up with power bank manufacturers to bring their own vision to the world of portable charging. 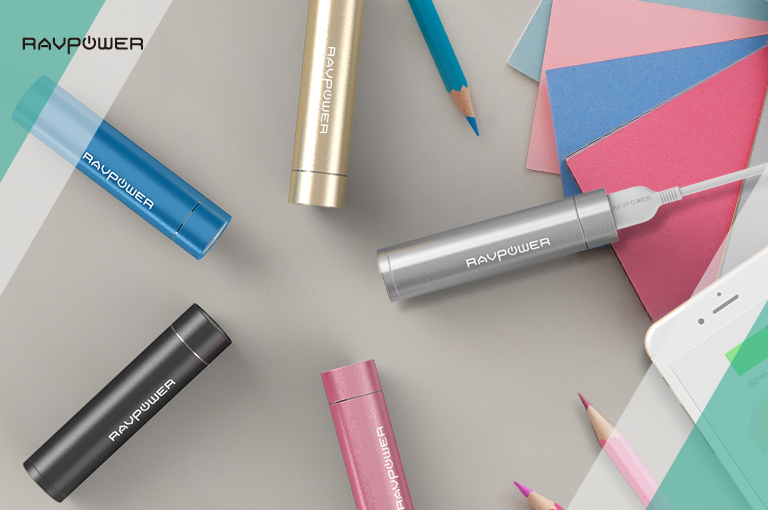 Global brands like the Pokémon Company had their own line of Pokémon-themed power banks, while a prestigious design firm like Studio F. A. Porsche have just launched their own power bank in collaboration with RAVPower. It’s a quiet revolution but for the fashion conscious, the right power bank is an essential accessory. We’ve all purchased a new gadget only to use half of its functions. Take for instance people that purchase an expensive DSLR only to use it like a point-and-shoot camera. While we’re all guilty of not using technology to its full capability, we typically do this because we don’t know how to use them or because they require something else. In the case of the latter, a power bank is particularly handy. One of the reasons to buy a power bank is to better enjoy the technological benefits of other devices. You may use the new 12-inch MacBook, which has a USB Type-C port to charge. Ordinarily you need to charge this from home. However, with a power bank with USB Type-C capability, you can now enjoy extended power wherever you go. Another example are phones with Qualcomm Quick Charge technology. If you have a compatible phone, a power bank enables you to make use of the fast charging capabilities of Qualcomm without being tied to a power plug to charge. Want to learn more about our Quick Charge technology? Check out our post about it here. While the central focus is usually on charging phones and tablets, power banks can charge more than just those two. In fact, given the right power bank, you can charge or power almost everything, including devices as diverse as laptops, fans, lamps, printers, drones, vacuums, humidifiers, string lights, portable massagers, cameras, and Go Pros. Gamers can use a power bank to charge their Nintendo Switch via the included USB Type-C port. It should be noted that for many of these devices, a standard power bank would not work. You need a special power bank with an AC output. The AC output allows that appliance to get the same amount of power it would get from a standard AC outlet in the home. Many appliances can connect, however if their required wattage is above what the power bank can supply, it won’t work. Therefore, it’s important to check beforehand if your device or appliance is compatible. Power banks with an AC output aren’t common, but they do provide that little bit extra to ensure you can charge [almost] everything. If you want to charge your appliances, check out RAVPower’s 100W power bank with an AC output here. A power bank isn’t just about charging your own device. 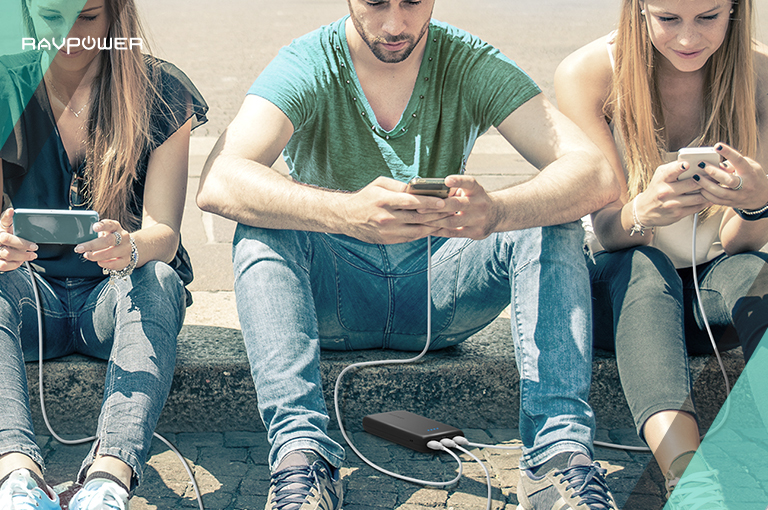 With 2 or even 3 ports available, you can share the load. While this is a convenience, the best part of keeping one with you is that it is an excuse to speak to people and even make new friends. Despite being closer through technology and social media, there are numerous media reports saying it makes us feel more alone. If you need more reasons to buy a power bank, how about the fact you can use one to get to know another person. Seriously! 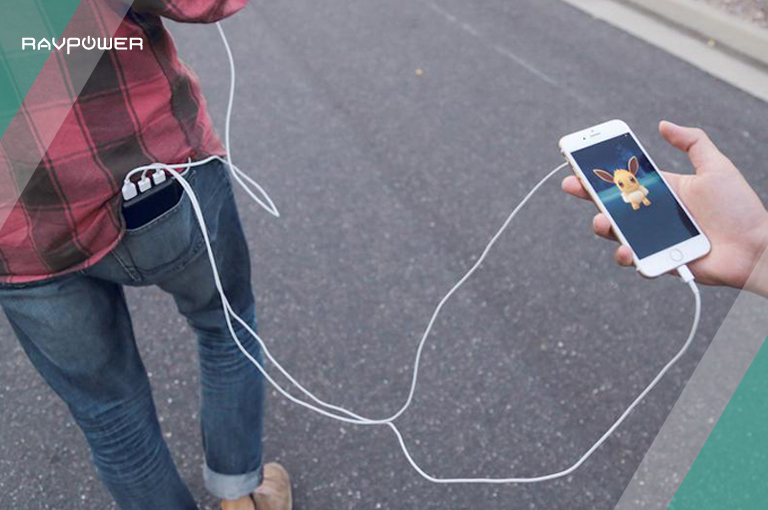 Next time you’re at a mobile gaming convention or walking around playing Pokémon GO or another augmented reality game, use a multi-port power bank to charge a stranger’s power bank and make a new friend. You never know who you might meet by lending a hand (or a charge). Everyone wants to buy a power bank because they are light, affordable, and most importantly, portable! In fact so portable, that people started to bring them everywhere. From flying with power banks, to heading out alone on hikes, these little chargers are wherever you look. It was partly because of their flexibility that manufacturers responded by including a number of safety protections to ensure they can be used no matter the environment. These protections include an impressive IP Code ratings to safeguard against dust and water. Some power banks even have shock-proofing and thicker shells in case they plummet from a height. A power bank has yet to reach the space but we’re confident that they’ll work there too. Do you have any other reasons to buy a power bank? Let us know in the comments below. Previous PostQuick Guide: How Do Power Banks Work?